Ah online bingo, what a wonderful creation don’t you think? Think back to the days when the only way to play bingo was to visit a bingo hall. Not only was it a gambling experience but it was, and still is, social hour for players. Players float around like butterflies chatting and socializing. Playing bingo is a game that is great no matter what your age. Bingo in the United States can take place in a church basement, school gymnasium, bingo hall and even in a land based casino. It’s probably here where the stereotype of bingo being a senior citizen’s game began. Bingo games are not only held for the gambling aspect but also for fundraisers for the grandchildren’s school and church donations. There may also be a table in the back of the room filled with baked goods that the women spent the day making plus coffee and juice. American bingo halls often have concession stands with snacks which is also another opportunity for social activity. Staff are walking around selling pulltabs adding to the buzz in the atmosphere. 75-ball bingo is the game played in the US and it tends to be called slowly allowing players to manage several bingo cards at once. Bingo in the United Kingdom is a totally different experience. There’s no lack of the social factor but the culture among bingo halls has been perfected. Doesn’t it just suit the essence of community perfectly to be the member of a bingo club? As a player at a bingo hall in the UK, you receive a card and you’ve joined the club. Not only will you find slots and bingo but there’s also a bar and diner inside these bingo clubs. There’s nothing that’ll increase a bingo player’s social capabilities more than a pint or two. The game of choice is 90-ball bingo where the calls come flying out and you’ve got to be fast to keep up. You’d be lucky to manage more than two or three cards at one time. Now we’ve got online bingo and not only is it convenient but it’s still a place for friends to meet. 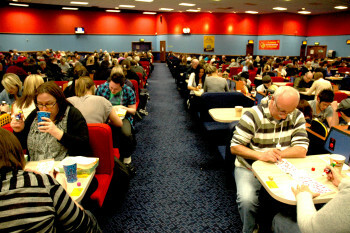 There are several ways that the social vibe of land based bingo has been mirrored online. The chat function and presence of chat hosts give players the opportunity to interact and hone those social butterfly skills of ours. Chat games bring players together as well as team bingo promotions. Online bingo operators often reward members for referring friends to the site. Tell your friends about your favorite online bingo site and you can earn a bonus. It doesn’t get much better than that. A site like Bingo Cams has taken the social theme a step further with the introduction of web cams. Not only can you see the caller and players but you can even chat with friends using the custom software. For a full review of Bingo Cams and other online bingo operators check out www.latestbingobonuses.com. Social networking sites such as Facebook also feature a wide variety of bingo games. Facebook is all about communicating with friends and what better place to play bingo than among your buddies? Go ahead and log on and you’ll see the numerous bingo games available for fun and real money and desktop and mobile devices. Can’t leave home? No problem. Flutter those wings over to an online bingo site to meet new people as well as old friends for a variety of unique themed bingo rooms, promotions and much more!